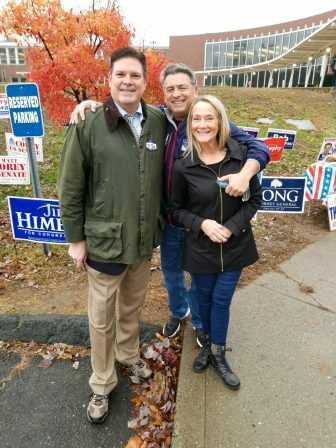 On left, State Rep. Tom O’Dea (R-125th) greets voters at the polls on Election Day. Nov. 6, 2018. 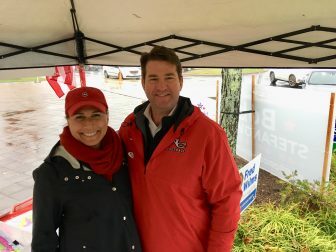 State Rep. Tom O’Dea (R-125th) started his day at 5:50 a.m. in Wilton and he planned to head to New Canaan High School in the early afternoon to greet voters. He referred to New Canaan’s delegation to the state legislature. Nearly 38 percent of New Canaan’s electorate had voted as of midday Tuesday, with 4,541 ballots cast to go along with 772 pre-marked absentees. The figure compares to about 50 percent of the electorate voting by 12 p.m. during the presidential election two years ago. 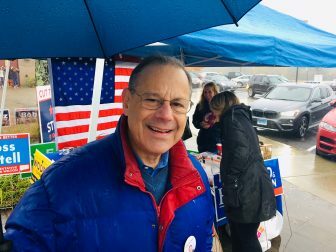 Ross Tartell, a Democrat challenging incumbent Republic state Rep. Tom O’Dea (125th) stood outside the polling place at New Canaan High School with an umbrella, as voters dashed through heavy rains toward the auxiliary gym. 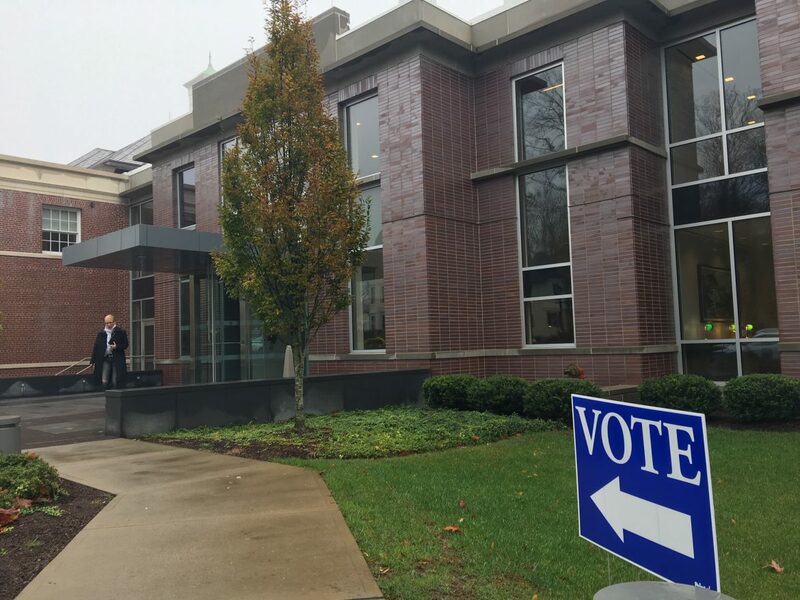 New Canaan constituents on Nov. 6 will cast ballots for candidates seeking elected offices including governor and lieutenant governor, U.S. Senate, U.S. House of Representatives, state Senate and state House. Based on absentee ballots issued, officials are expecting strong turnout at the polls. According to sample ballots issued by the Connecticut Secretary of the State (see below): candidates for governor include Democrat Ned Lamont, Republican Bob Stefanowski and Libertarian Rodney Hanscomb; lieutenant governor include Democrat Susan Bysiewicz, Republican Joe Markley and Libertarian Jeffrey Thibeault; U.S. senator include Democrat Chris Murphy (incumbent), Republican Matthew Corey, Libertarian Richard Lion and the Green Party’s Jeff Russell; candidates for U.S. Representative (CT-4) include Democrat Jim Himes (incumbent) and Republican Harry Arora; candidates for state Senate (26th) include Democrat Will Haskell and (incumbent) Republican Toni Boucher, state Senate (36th) include Democrat Alexandra “Alex” Bergstein, Republican L. Scott Frantz (incumbent) and the Green Party’s Megan Cassano; candidates for state House (125th) include Democrat Ross Tartell and Republican Tom O’Dea (incumbent), and state House (142nd) include Democrat Lucy Dathan and Republican Fred Wilms (incumbent). Other offices up for election include treasurer, comptroller, attorney general and judge of probate. John Amarillos and Joan McLaughlin are appearing on the ballot as the Democratic and Republican Registrar of Voters candidates, respectively. Not sure where you’re going to vote? Check here.